Here is a video in layman’s terms that clearly exposes truths and myths about genetically engineered (GE) food, also commonly referred to as GMO (genetically modified food). The information in the video is based on a report by Earth Open Source and credits are given at the end. Here is a short video featuring a conventional farmer who claims that food labeling is a win-win. His argument is that farmers give the people what they want and if because of labeling, they demand food that is not GMO, then farmers can deliver because, as he puts it: “We’re ingenious people.” It is an interesting and perhaps surprising take on the issue. According to an article posted on the “Yes on 37” website, because of the results of a recent French study showing that GM corn causes tumors in rats, Russia has decided to suspend the use of Monsanto GM corn until further information becomes available. The French study is shrouded in controversy but is apparently compelling enough to cause one country to take swift action. Well done, Russia. Here is the article, originally from the Wall Street Journal. Below I have another excerpt of a letter sent to my personal email from Organic Consumers Association leader Ronnie Cummins. His passion for this cause is admirable. I want to underscore one of the things he says below in his “reasons why California prop 37 should pass”. GMOs are everywhere. Today, most non-organic US corn, soy, cotton and sugar beets – which are used in most of the sweeteners and additives used by food processors – are genetically engineered. So is the feed fed to the animals you eat. In fact, 75 – 85% of the processed food in your grocery store contains unlabeled GMOs. This statement is so very true. Unless you hole up in a cave and never see a supermarket or a restaurant, you simply can’t live GMO free. Dinners out, business lunches, traveling, eating meals at other people’s homes, going to parties, picnics… We simply have no control over food being served elsewhere – unless we choose not to eat it. I was just at my book club meeting last night and there were sugary cocktails being served which no doubt were either high fructose corn syrup sweetened or beet sugar sweetened. The theme was cajun so we had red beans and rice and fried catfish… no doubt fried in canola or some other GMO laden vegetable oil. I sometimes feel already defeated in my desire to take a stand and be GMO free. I know Organic Consumers Association wants donations. I may just donate. I have never donated to a “cause” before and I think my time has come. Put up or shut up as they say. Last week French scientists published the results of the first ever long-term study on the health effects on lab rats of Monsanto’s GMO corn and its best-selling herbicide, Roundup. According to the study, published in the peer-reviewed journal Food and Chemical Toxicology, rats fed a lifetime diet of GMO corn and the herbicide-tolerant GM corn, or given water containing Roundup in amounts considered safe in drinking water and GM crops in the US, suffered tumors, multiple organ damage and premature death. The study drew some criticism for its methodology. But it highlighted the fact that we know very little about the long-term health consequences of a GMO-laden diet. It also raised this critical question: Why are GMOs allowed in our food, without our knowledge, when it’s clear that they have not been proven safe? Here are 8 reasons you want Prop 37 to pass, and why we’re asking for your support. 1. GMOs have never been proven safe. The FDA conducts no independent testing of GMOs, but instead claims that they are “not substantially different” from non-GMO foods. 3. GMOs are everywhere. Today, most non-organic US corn, soy, cotton and sugar beets – which are used in most of the sweeteners and additives used by food processors – are genetically engineered. So is the feed fed to the animals you eat. In fact, 75 – 85% of the processed food in your grocery store contains unlabeled GMOs. 5. GE crops are responsible for super weeds and super bugs, soil degradation, and lack of diversity – which makes crops and humans more susceptible to disease. 6. The only folks who don’t want you to know what’s in your food are huge corporations like Monsanto, Dow AgriScience, BASF and food conglomerates like Pepsi and Coca-Cola – who along with other biotech, pesticide and processed food manufacturers have donated nearly $33 million to defeat Prop 37. 7. This is our best – and perhaps only – shot at labeling GMOs and ending Monsanto’s monopoly of our food supply and destruction of our health and environment. Nineteen other states have tried – and failed – to get a GMO labeling law through the state legislative process. 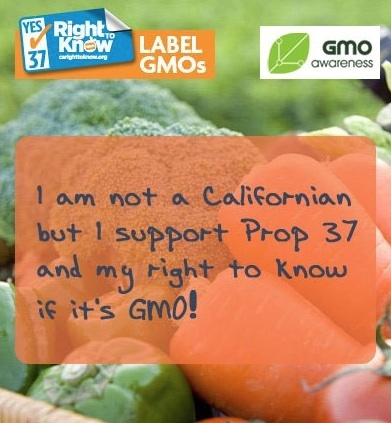 Prop 37 takes GMO labeling direct to the voters so Monsanto’s lobbyists can’t kill it. 8. If this law passes in California, food manufacturers have admitted that it may as well be a national law. They won’t want to put ‘this product contains GMOs” on their labels, so they will reformulate their products. And if they reformulate for California, they may as well do it for all of their products. Here is a very informative article that came out of the UK in June of this year: GMO Myths and Truths. I found it at the Non GMO Project website (see previous post) and by clicking this link, you’ll be directed there, where you can then download the PDF. There is purported to be a growing group of companies who want to keep GMO out of their food and so are voluntarily submitting to testing in hopes of becoming certified. If all is well, the food should have the label “Non GMO project” stamped somewhere on the packaging. Personally, I haven’t seen one product with this label so I know it is not something you’re going to find at your local Safeway or Albertsons – not without a magnifying glass and a lot of time. It does make sense to have companies who care about GMO voluntarily label their foods as safe, rather than go up against Big Agri and so many non-caring food companies in an effort to mandate food labeling – as is happening in California during this prop 37 war. But in the case of voluntary labeling, sadly, there would still be so many unsuspecting people who don’t even know GMO is happening – let alone that they’re eating it, a lot of it, every day. There is a plethora of informative articles to choose from at this site: myths and truths, what is GMO, the latest on what’s happening, etc.